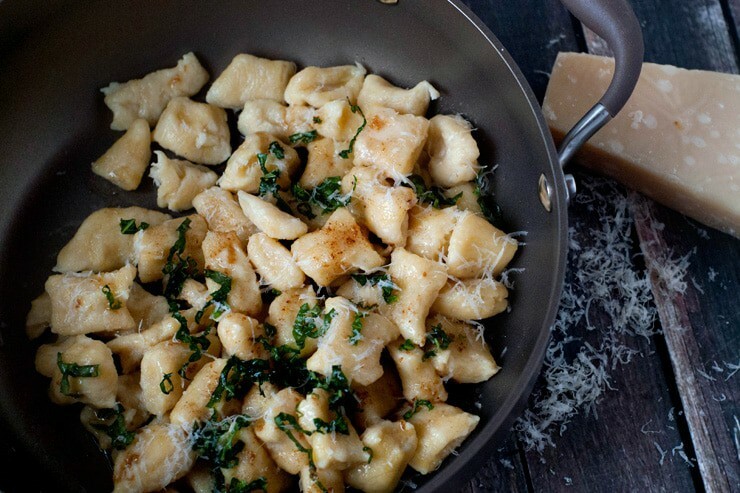 You Are Here: Home » Ricotta Gnocchi with Browned Butter, Fried Basil and Giveaway! 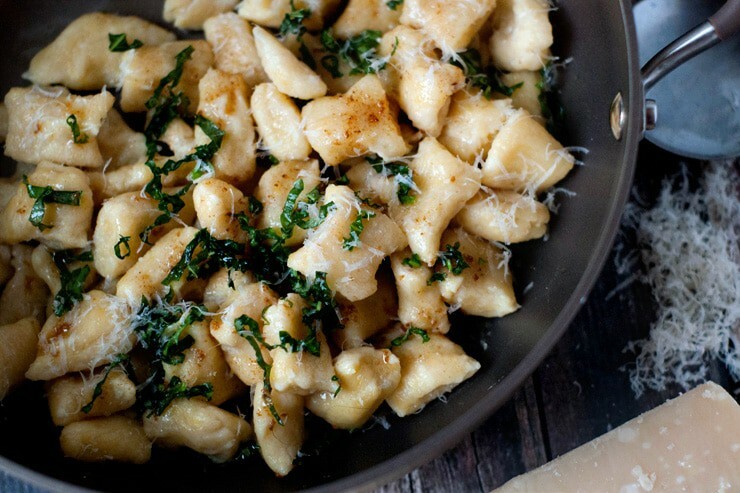 Ricotta Gnocchi with Browned Butter, Fried Basil and Giveaway! 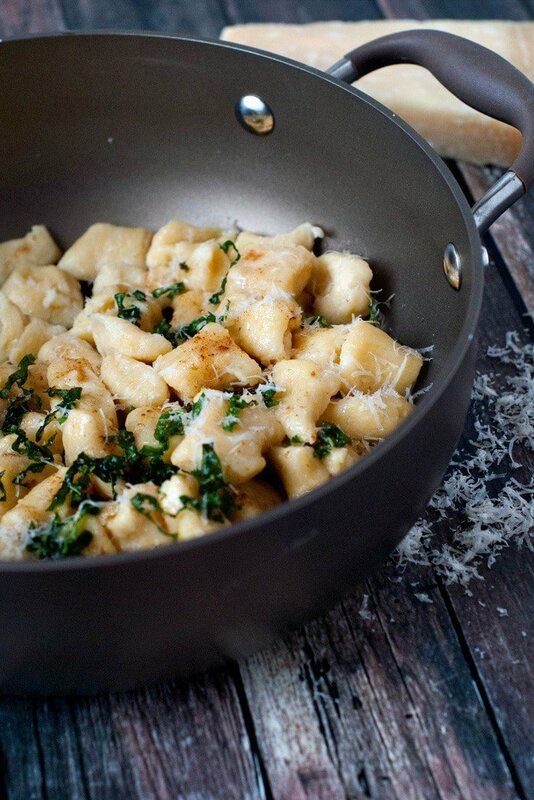 Ricotta Gnocchi with Browned Butter, Fried Basil – You’ve had Gnocchi before, right? If not, oh boy. These bad boys are so stinkin’ good. Gnocchi are kind of like little dumplings that can be made out of potatoes, semolina flour, or as is the case with today’s recipe, ricotta cheese. For me, it’s kind of therapeutic to make the dough, roll out, cut and cook these. But, if you’re of the “put a minimal amount of effort in the kitchen” camp, you can totally make this Ricotta Gnocchi recipe too. Making the dough is as easy as mixing 5 ingredients in mixing bowl and if you have any play dough skills AT ALL, you can roll out the dough into logs, cut and put into boiling water. They even tell you when they are cooked all the way by floating to the top of the pan when cooking! Gnocchi can be used just as regular pasta and are great tossed with tomato sauces and pestos but today I went simple and paired them with a simple browned butter that I fried some fresh basil in. If you can melt butter and cut basil, this Ricotta Gnocchi is for you! If you’ve been following along with me for the past 5 weeks, you might have already figured out that this recipe is part of my partnership with Anolon. Each week I’ve used a different piece of cookware from them to make my recipes in and I have one more to go (my favorite one) next week. You can find the recipe by clicking the link below! Want to See Another Gnocchi Recipe? I love the 13 x9 pan!! I would make this no knead bread!!! I would love the 9×13 baker! I would love to win one of these beauties! my FAV? 4-QUART OVAL COVERED CASSEROLE, PAPRIKA RED. I really like the 3.5 quart covered chef pan. I think I’d want the covered casserole in red! Would definitely choose the Anolon Vesta Stoneware 9×13” Baker in Paprika Red to make lasagna!!! I would love to have the 3-QUART COVERED SAUTE WITH HELPER HANDLE! i have such a variety of old/odd pans collected during my 55 yrs of cooking, it would be nice to have somthing new! I choose the Anolon Vesta Stoneware baker in paprika red.